That's why T-Rex Engineering has created The Sweeper – a stunning chorus pedal for the bass that revives the sound of the chorus and gives bassists working in all styles of music a new tool for delivering classic bottom end. The Sweeper isn’t especially complicated, or packed with all sorts of extra features. It’s a simple, intuitively designed pedal that does just one job – producing an exquisite chorus effect for the bass – better than many other pedals on the market. The secret to The Sweeper is its tone. Designed exclusively for the bass, this pedal gives you a gorgeous chorus effect no matter what depth or rate you set. There's not a frequency wasted on tone that might work for a guitar – but not for the bottom you have to deliver. So plug it in and try it for yourself. 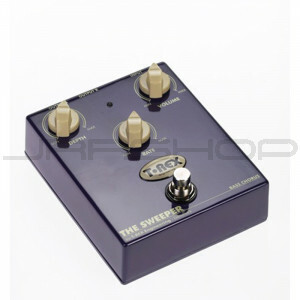 We're convinced The Sweeper will quickly become the one pedal you can't play without.